We all should be aware by now that Internet users are impatient when it comes to waiting for a web page to load. Thus, your website’s performance and ability to render speedily is critical to its usability and, ultimately, its success. Site speed not only hurts user experience but it also has a direct impact on SEO so it doesn’t matter if you are an auto parts retailer or a school, it should be something you monitor. In order to help you build faster websites and identify troublesome website performance bottlenecks, consider incorporating some of the following tools into your web development process. Tip: It might be a good idea to use several of these website speed-testing tools so that you can obtain a better picture of site speed issues. Heck, they’re free, so why not? 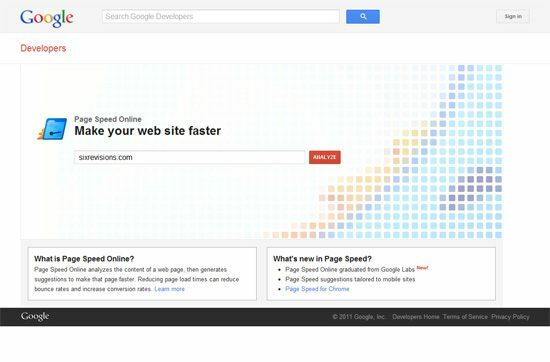 Google’s Page Speed Online — which is a web-based adaptation of the popular Google Chrome web development browser extension, Page Speed — analyzes your website’s performance under Google’s Web Performance Best Practices (a set of rules for optimal front-end performance). You can gain lots of information from this handy web tool – it even includes a report for mobile device best practices for optimal performance. This interesting tool pits two websites against each other in terms of loading time; for example, you can find out if Google loads faster than Bing does by using this tool. 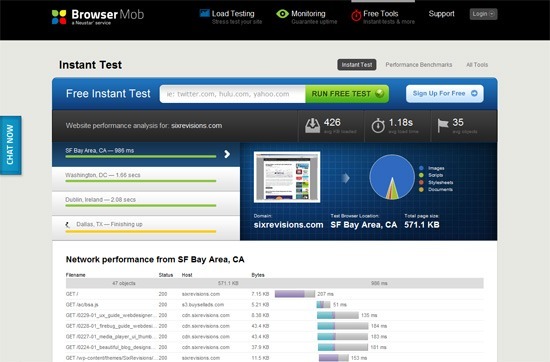 This can be a simple tool for comparing whether your website performs better or worse than competing sites. This open source tool (view the source on GitHub) was originally created to promote the importance of web performance. This nifty online tool tests your web page’s rendering speed in real browsers (Chrome, Firefox and IE) and gives you a choice of conducting the test from several locations around the world. It also has advanced settings with options for simulating common Internet connection speeds (e.g. DSL and 56K dial up) and ad-blocking so you can see the performance cost of running ads on your site. This simple web page speed test analyzer — probably one of the oldest tools out there with its first version released in 2003 — gives you data on your web page’s size, assets and load time. It also supplies you with recommendations on things you can make better. This is the web-based version of the open source server application by the same name (Show Slow). Show Slow allows you to add a URL to be monitored (publicly) and regularly captures results from three popular testing tools: YSlow, Page Speed and dynaTrace. This tool requires registration. This web-based website speed testing tool displays relevant data on page-rendering time, such as total download time, number of connections made and number of requests made. It also has some bonus features such as being able to run the test even if the web page has HTTP authentication (simply supply it with the password to the page) and the ability to simulate different types of Internet connections. 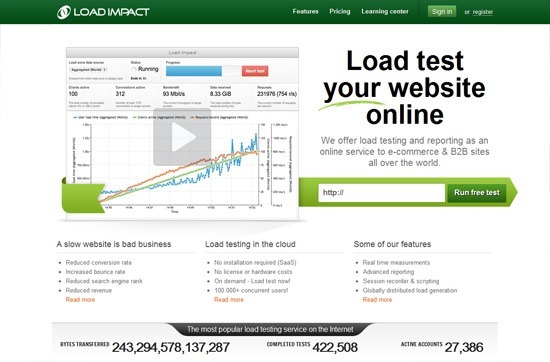 Load Impact’s free online load testing and performance tool gives you plenty of data on your website’s ability to handle website traffic. This online web performance evaluation tool has the ability to show graphed data such as user load time (simulated by an automated virtual machine) and requests per second (helpful for seeing how durable your web server is and how fast it can handle web page requests). 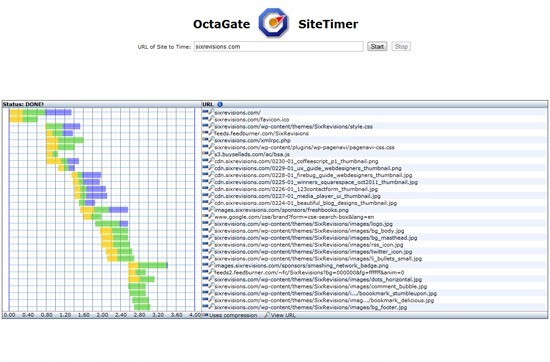 OctaGate SiteTimer is a rather straightforward online tool: you plug in the URL you want to test and, in turn, it will output a bar graph featuring all web page objects containing information such as download start times, end times and duration for each. This tool is beneficial for quickly discovering slow-loading page objects so that you can optimize them to improve website speed. 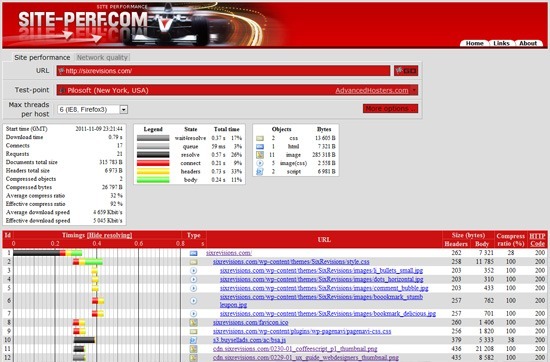 Web Site Performance Test (Gomez) – a real-time site performance tool displaying information on things such as DNS lookup time and connection time. Webslug – similar to the Which loads faster? 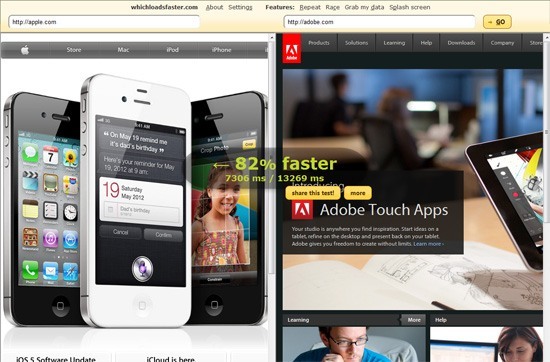 tool mentioned above, this web tool will compare the site performance of two websites. WebWait – a basic website speed timer with options for specifying the number of requests to make and the interval between requests (e.g. 5 requests in 10 seconds). Website Speed Test (Searchmetrics) – provides plenty of data on page speed, including estimated load times for various types of Internet connections. Website Speed Test (WebToolHub) – a rather basic online tool that provides data such as page size, load time, download speed and average speed in tabular format. 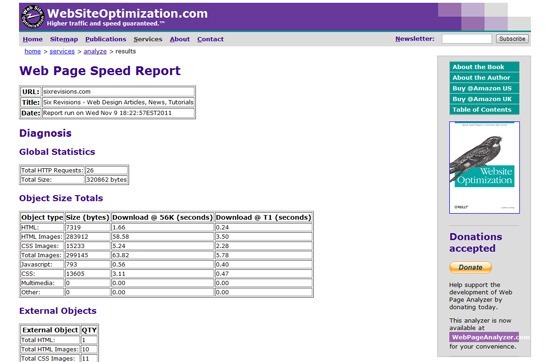 Yottaa Site Speed Optimizer – this web performance analyzer outputs great-looking reports. This tool requires you to sign up. 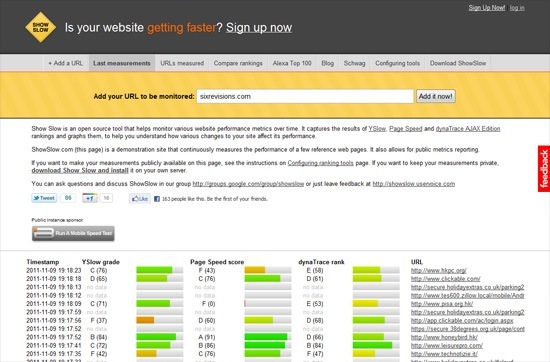 Zoompf Free Web Performance Scan – this tool will scan a web page and gather data pertaining to web performance. You are required to provide and verify your email address in order to run tests. Site speed checker – a web-based site speed tool that allows you to run tests on 10 URLs all at once. Free web site speed test (Self SEO) – this simple website speed testing tool gives you the option to enter up to 10 URLs to run tests on simultaneously.